The mysteries of the Rosalie and the Rubicon have remained the mysteries up to this day. Nobody knows what happened to their crews. The world has recorded several other cases, one on the most famous being the Marie Celeste. But even more ships have been disappearing completely- with no traces of the survivors or wreckage. They are simply gone. The American warship Pickering was the first recorded case; it disappeared in 1800 with 90 people on board. In 1931 an aircraft disappeared. It was the first of many. One of the most famous cases was the disappearance of five American military aircrafts. They radioed for help on December 5th 1945. A rescue craft left immediately but not one of the six planes returned to base. The search was intensive, but nothing, no bodies, no wreckage, no oil was found. A count made in 1977 of lost crews, ships and planes noted a total of 143 disappearances. A very great number of these occurred during the 60's and the 70's. For years, people have been giving different solutions to this problem. Someone has suggested it might be an illness that kills everybody. But who could throw all the bodies overboard? Perhaps it was a mental illness and everybody on board went mad and jumped into the waves. Pirates are another possibility; people have mentioned them in the sea books ever since the 18th and the 19th century. Recently they have been taking smaller boats, repainting them and using them for smuggling. But pirates also want cargoes and cargoes have stayed untouched on most of the ships. It's reasonable to think that storms, heavy seas and high winds have been the reason for the disappearance of so many ships and planes, but usually something is found later… bits of wood, oil, life jackets, anything. 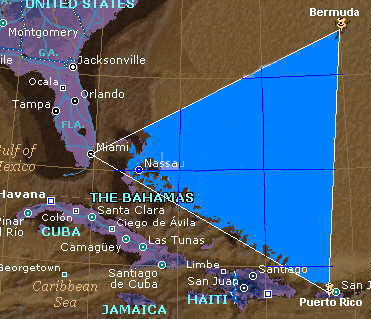 All these mysteries are connected by one thing-they have happened in or near the so-called Bermuda Triangle. But such events have also occurred at the opposite side of the world, not far from Japan, in an area called Devil's Sea. There have been many bizarre events associated with these two areas. When will we know the answer?